If Arizona bill becomes law, will NFL move Super Bowl? Arizona Gov. 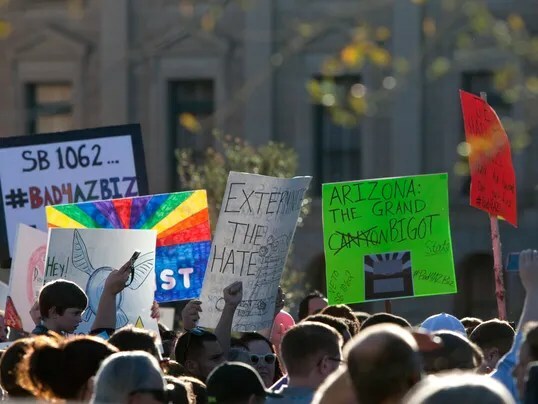 Jan Brewer has until Saturday to either veto, sign or let become law a bill that would allow businesses in her state to deny service to lesbian, gay, bisexual or transgendered people based on the religious beliefs of the business owner. The National Football League is among those watching closely. Super Bowl XLIX is scheduled for next February 1 at the University of Phoenix Stadium in Glendale. The NFL has stopped short of saying the game could be moved elsewhere if the legislation becomes law, but the league has moved a Super Bowl out of Arizona before, and the implicit threat floats invisibly but menacingly in the desert sky. The controversy comes as the NFL is readying to welcome its first openly gay player in Michael Sam, the Missouri linebacker who came out this month, and just as Jason Collins played his first game for the NBA’s Brooklyn Nets as the first openly gay active player in the nation’s four major sports leagues. Comment from others is plentiful. Delaware Gov. Jack Markell said the NFL should consider moving the game if the bill becomes law. The Arizona Super Bowl Host Committee said passage of the bill would “deal a significant blow to the state’s economic growth potential.” And Wade Davis, a gay former NFL player who is executive director of the LGBT activist group You Can Play, said he also hopes that the NFL will move the game should the bill become law. The potential collision between state politics and the National Football League comes in the form of SB 1062. (SB stands for Senate Bill, not Super Bowl.) The bill comes out of a New Mexico legal battle involving a wedding photographer who told a lesbian couple that she would not photograph their commitment ceremony in 2006 because it clashed with her religious beliefs. The photographer was sued for sexual-orientation discrimination and lost in the New Mexico Supreme Court. The Arizona bill was written by the conservative-advocacy group Center for Arizona Policy and the Christian legal organization Alliance Defending Freedom. The bill would allow individuals to use religious beliefs as a defense against lawsuits and supporters say it would tweak existing state religious-freedom laws intended to ensure that individuals and business owners are not forced to go against their own beliefs. Many prominent leaders in the Arizona business community oppose the bill. They sent a letter to Brewer urging her to veto the bill because it would expose businesses to a higher risk of lawsuits and hurt efforts to attract workers. “The legislation is also already clearly having a negative effect on our tourism industry, one of the largest sectors of the economy,” said the letter signed by presidents of several business groups, including the Arizona Chamber of Commerce and Industry. It’s back to the future for Arizona. 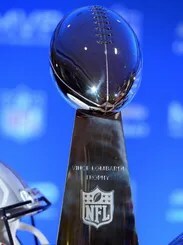 In 1990, then-NFL commissioner Paul Tagliabue threatened to move the 1993 Super Bowl out of Arizona if the state refused to recognize Martin Luther King Jr. Day. Voters turned thumbs down on the holiday and the NFL moved the 1993 Super Bowl to the Rose Bowl in Pasadena. Arizona subsequently voted to recognize MLK Day in 1992 and the 1996 Super Bowl was played in Tempe’s Sun Devil Stadium. In that case, the NFL had three years lead time to relocate the Super Bowl from Arizona. The coming Super Bowl is about 11 months away. Is that enough time to make a switch should the NFL choose to do so? When the events of 9/11 pushed the Super Bowl back a week after the 2001 season, Super Bowl host New Orleans had a conflict because of a national automobile dealers convention. Steeg said the NFL considered moving the game to Miami with talks as late as October – “so that gave us 120 days to try to put that together” – before the auto dealers swapped dates with the NFL. The current situation differs as it is a senate bill rather than a public referendum. And the clock will tick all week as Brewer decides what to do. Bragman, whose firm Fifteen Minutes represented Sam at the NFL scouting combine, said among the factors that have energized the gay community of late are the Russian anti-gay laws that were one of the central controversies of the Sochi Games. You Can Play is dedicated to taking homophobia out of sports. One of its co-founders is Philadelphia Flyers scout Patrick Burke, son of Brian Burke, president of hockey operations for the Calgary Flames. Davis is You Can Play’s executive director. The NFL partners with You Can Play on its “High Five Initiative,” through which pro athletes visit LGBT youth organizations. He said the Arizona bill, and others under consideration in other states, are not all that surprising in the push and pull of history. “For some reason, it’s a part of our culture that if we have progress in one direction, there’s a regression in another,” Davis said. “What I find is that we really have a tough time as a country just seeing humanity and seeing that everyone in this country is each other’s mirror and they reflect back on ourselves. You are currently reading If Arizona bill becomes law, will NFL move Super Bowl? at ARE YOU NEXT.